NETWORK FINALS: YOUNG SHELDON lost 0.1 in final numbers. CABLE HIGHLIGHTS: TNT’s NBA doubleheader was at 0.88 (Golden State vs. 76ers)/0.54 (Toronto vs. Milwaukee). TLC’s august DR PIMPLE POPPER jumped 0.12 to 0.75, and UNTOLD STORIES OF THE ER was at 0.35. ESPN’s original documentary DEON’S DOUBLE PLAY was at 0.54. On A&E, 60 DAYS IN dipped 0.03 to 0.42, HOMICIDE SQUAD was steady at 0.34, and FIRST 48 was down 0.04 to 0.33. On MTV, FLORIBAMA SHORE rose 0.06 to 0.40, and EX ON THE BEACH was down 0.03 to 0.34. On Bravo, TOP CHEF held at 0.33, MILLION DOLLAR LISTING ticked down to 0.23, and BACKYARD ENVY was up 0.03 to 0.10. On History, SWAMP PEOPLE returned at 0.32, and the season premiere of TRUCK NIGHT IN AMERICA was at 0.28. MSNBC’s RACHEL MADDOW SHOW led cable news at 0.31/0.47/3.2M, with CNN’s CUOMO PRIME TIME at 0.26/0.37/1.4M, and Fox News’s TUCKER CARLSON TONIGHT at 0.22/0.40/2.9M. On ID, DEADLY SECRETS dropped 0.04 to 0.27, and DEAD OF WINTER was down 0.05 to 0.25. 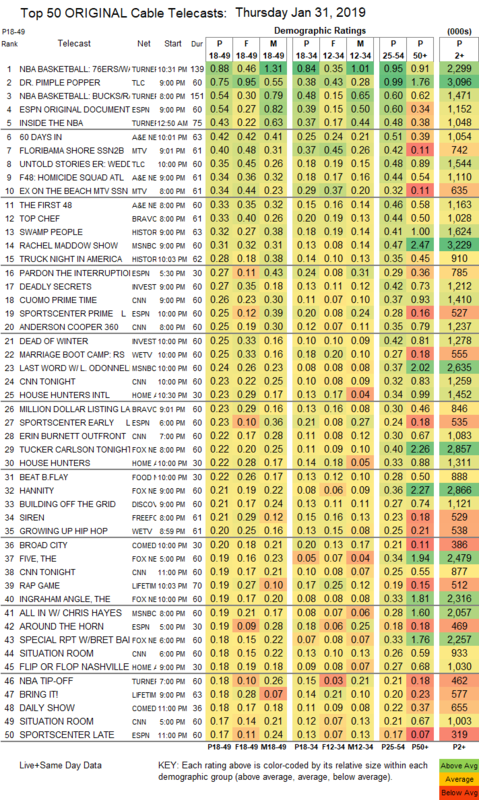 On We, MARRIAGE BOOT CAMP gained 0.03 to 0.25, and GROWING UP HIP-HOP was down 0.02 to 0.20. On HGTV, HOUSE HUNTERS INTL fell 0.08 to 0.23, HOUSE HUNTERS dropped 0.07 to 0.22, and FLIP OR FLOP was down 0.07 to 0.18. Food Network’s BEAT BOBBY FLAY toppled by 0.18 to 0.22. Discovery’s BUILDING OFF THE GRID was steady at 0.21. Freeform’s SIREN slipped 0.02 to 0.21. On Comedy Central, BROAD CITY shrank by 0.02 to 0.10, and THE OTHER TWO was down 0.04 to 0.11. 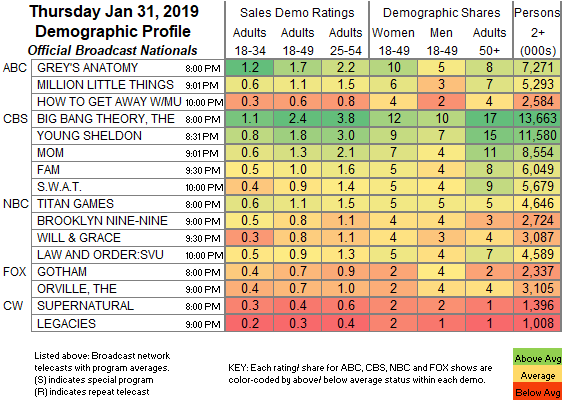 On Lifetime, THE RAP GAME lost 0.02 to 0.19, and BRING IT was down 0.04 to 0.18. Paramount’s LIP SYNC BATTLE fell 0.09 to 0.11. On Tru, THE CARBONARO EFFECT dropped 0.03 to 0.10, and INSIDE CARBONARO was down 0.03 to 0.08. "Sorry, we don't provide news network ratings below the daily Top 150." "Sorry, we can't provide more detailed ratings for those shows than we already do." "Burst: 0.02/111K Ares: 0.01/84K & 0.01/62K"